UJAM has just released a line of virtual bassists. Mellow, Royal, and Rowdy. As with their virtual guitarists and drummers, these instruments ship with a fantastic library of phrases in a variety of styles that can easily conform to your own chord progressions. And, as with their other instruments, they are designed to get a variety of tones with minimal fuss. UJAM have sure got the right formula for striking the balance between complexity and ease of use. Which is no small feat! They provide just the right amount of detail. Too much, and it becomes daunting to understand. Too little, and it’s dismissed as a toy. With these, we get a library of fantastic sounding tweak-able grooves. Plus something new! In this video, sponsored by Universal Audio, we look at using the Lexicon 480L on a pop vocal duet. Using Lexicons Random Spaces algorithm, we use the Lexicon’s unique pre-echo, spin, and wander controls to work to craft a unique and compelling vocal space to help the vocals sit nicely in a relatively dense arrangement. Logic Pro Expert Contributor, Chris Vandeviver, reviews the newest offering from innovative upstart Mastering the Mix. In this review, Chris examines Animate, a unique plugin that takes expansion to a whole new level. Eventide has released the SP2016 reverb plug-in, based on their hardware model released in the 80’s. The hardware unit was one of pro audio’s first rack-mount multi-effects processors This newly released plug-in version features great sounding rooms and plates. See it in action as we put it to work in Logic on various tracks. Just imagine you can have the power of 1073 EQ’s with the SCHEP 73 emulations throughout your entire mix. Gotta love that!. Here's Eli Krantzberg's review of Newfangled Audio's Elevate, a new multiband mastering plugin that uses the same 26 band filter bank we were introduced to with the free EQuivocate plugin. Newfangled Audio's 26 paragraphic band EQuivocate plug-in grabbed everyone’s attention recently, with its MEL scale based division of the frequency bands based on the natural contour of the human hearing. Now, with Elevate, they are offering us a rethink on how a multiband mastering limiter works. Elevate uses the same 26 band filter bank we were introduced to with EQuivocate, to separate the audio into frequency bands similar to the frequency curve in the human ear. It then uses adaptive algorithms to calculate optimal limiting, transient shaping, and spectral clipping for each band. Of course, these can all be tweaked manually as well. The Main Page contains all the important parameters for each of the functions. The sub-module pages are used to burrow in deeper to each section for more nuanced manual control. After setting the number of bands for the limiter to use, the gain and speed sliders are used for traditional ratio and release style limiting controls. The secret sauce comes in when the Adaptive Gain and Adaptive Speed functions are enabled. The Adaptive Gain parameter allows the algorithm to adapt the gain applied to each frequency band individually, allowing more gain reduction to be applied to the loudest bands if the signal is near the limit. The value setting is the number of dB by which each band can stray from the others. In other words, this controls, or scales, the variations being calculated. Moving the Speed slider up increases the dynamic response of the limiter. The Adaptive Dynamics parameter adapts the attack, release, and look-ahead parameters for each filter band, greatly reducing pumping and breathing artifacts as well as perceived distortion. 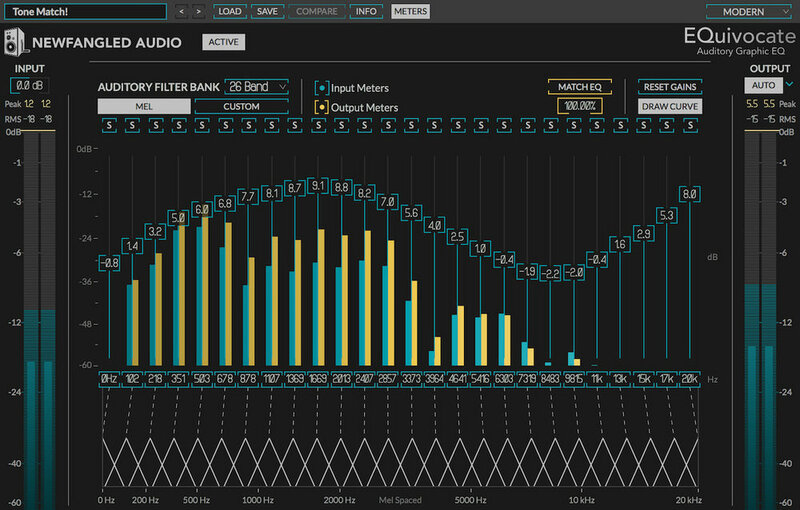 Use the FilterBank page to customize the MEL scale frequencies. Individual bands can be added, widened, removed, or soloed. Curves can be drawn with the mouse. The Limiter/EQ page is used to manually adjust the gain per band. They can be adjusted individually or drawn in a curve like fashion as well. Look-ahead style mastering limiters tend squash transients and reduce the dynamic impact of music. Elevate alleviates this problem by re-emphasizing these transients and driving them into a clipper stage. The Transient Emphasis slider allows you to compensate for the squashing effect by allowing fast transients through the limiter or even emphasizing them for a more explosive sound. To the left of Transient Emphasis is a button which allows you to deactivate this part of the algorithm. The Adaptive Transient parameter allows the Transient Emphasis engine to be adapted to each filter band individually. The Transient sub-module page is used for manual adjustments on a per band basis. The Spectral Clipper allows you to clip transients, or even drive the entire signal into it. The Drive parameter allows you to increase the Limiter output into Spectral Clipper to increase loudness and distortion. It does this according to a gain curve determined by the Shape parameter. The Shape parameter changes the shape of the gain curve from soft to hard. Elevate's user interface has all the modern conveniences we've come to expect from modern limiters. The Gain Lock button is a nice touch. It prevents sudden gain changes when toggling through different presets. The Match Level button allows for constant gain when activating/bypassing the limiting so as not to be distracted by level differences when auditioning the effects of various settings. Input into the plug-in is easily adjusted at the top of the Input meter. The Output meter offers another optional stage of protection against volume jumps when it's set to automatic. Make sure to set it back to manual though before processing any audio. The scrolling input/output, gain reduction, and Filterbank metering offers extensive and detailed visual representation of what the multiband limiting plug-in is doing. I can't wait to see what they come up with next. This is definitely a plug-in developer to keep your eye on! Elevate costs $99 through October 31, 2017. If you have Equivocate (still free until October 31st) you pay $79! Review - Eventide EQuivocate - Free until October 31st! a screenshot of EQuivocate, new powerful and precise paragraphic EQ plugin developed by Eventide. Eli Kranzberg reviews Eventide EQuivocate, a brand new powerful and precise paragraphic EQ plugin developed by Eventide. It's like Logic Pro’s Linear Phase EQ and Match EQ combined, and on steroids! The plug-in itself, along with the soon to be released mastering limiter Elevate, has been developed by Newfangled Audio. They are a new company launched by the creator of Eventide’s Black Hole, H3000 Factory, and H910 plug-ins. EQuivocate is a perfect EQ plugin for mixing and mastering. It uses filters which are modeled on the MEL scale, which is based on the critical bands in human hearing. Each of the 26 critical bands tickles a different part of your inner ear, making any combination of settings sound as natural as possible. Combining this with a linear-phase filter shape that reduces pre-echo makes EQuivocate an EQ with a difference you can hear. The “paragraphic” part of the name is because, unlike traditional graphic equalizers with fixed bands, you can drag the center frequency in each of these bands to shift the weighting. There is also an excellent Match EQ feature on it that is simple and intuitive. EQuivocate is like Logic Pro’s linear phase EQ and Match EQ combined and on steroids! Eventide is offering this plug-in for free until the end of the month. I’d suggest grabbing it now and giving it a try. Take note though, that you do need an iLok account. Elevate is a multi-band limiter, human-ear EQ, and powerful audio maximizer that increases the loudness of your mix while maintaining or improving the musicality. It uses intelligent, adaptive technology that responds in real time to your music; creating not only the loudest but the best sounding master. If you have Equivocate you pay $79! So just by downloading the free plug-in, you will save an additional $20 from the intro price. This sale ends October 31st. Blue Cat Audio announced the release of Late Replies, a new creative delay and multi effects plug-in capable of hosting built-in or third party plug-ins anywhere in the signal path. Here's Eli Krantzberg's review. Blue Cat Audio is coming up in the plug-in world. The interface redesign introduced with their recent update of the MB 7 Mixer and Patchworks, and also used in Destructor, have made the power of their programming much more accessible to the end user. And more fun! Now with the launch of their new plug-in Late Replies, Blue Cat Audio has given birth to a new hybrid delay/multi-effects plug-in that is not only powerful in ways we have never seen before but creatively stimulating. And most importantly, intuitive and easy to use. Late Replies is a powerful delay and multi effects plug-in that can be indefinitely extended by incorporating either Blue Cat Audio’s incredible sounding built-in effects, or third party plug-ins (VST, VST3, or Audio Unit format). Effects processing can be added in any or all of four stages in the signal flow. First, up to four effects plug-ins are available at the input stage, effectively processing the source audio before it is fed to the rest of the plug-in. Secondly, up to four effects can be added to each of the potential eight taps (or replies) generated in the Pattern Module. The third location is the Loops module, which incorporates two parallel feedback loops that can also be fed back into each other. Each feedback loop has the ability to host built-in or third party plug-ins so that each new echo gets more effects than the previous one. The fourth stage of effects processing is the output stage, once the signal has passed through the taps and feedback loops. The Base Delay settings define the value used by the Pattern and Loop sections. The delay, relative to the base delay value, can be set independently for each of the eight potential taps, or replies. Think of the grid as a way of sub dividing the base delay value So, if the base delay is set to a value of 1.00 (quarter notes), the grid can be set to divide that basic pulse into two, three, four… up to eight sub divisions. Replies can be placed evenly on the grid divisions, or, ahead or behind them for a pushing or pulling feel. If the base delay is set to 1.50 for example (dotted quarter notes), the grid sub divisions are based on that value. The base delay value can also be set in milliseconds, free of the host tempo. So there is complete freedom to place the generated replies exactly where you want them. In fact, there is a dice icon to randomize their placement, for inspiration. The Pattern Mixer lets you manage the levels, panning, and phase of each reply as well as apply the above mentioned per-reply effects. The Loops module contains two parallel feedback loops (echoes) that can interact with each other via cross-feedback and cross talk. The Loops Module has its own independent grid, used to define a pre-delay, and the length, for each of the two loops. Loop start point and lengths can be snapped to the grid, or placed freely. They can also be randomized, for inspiration. Each loop has its own phase buttons, plug-in slots, mixer settings, and freeze controls. Both the pattern and loops modules host their own presets either for the full module or for just the grid sequences. To round out the features of this workhorse, built-in ducking allows the user to duck the signal based either on the input source audio or via a side chain input. In addition to more effects processing, the output stage also includes a stereo spread control and built-in brick wall limiter; which is a great safety net when experimenting with feedback loops! Rounding out the control Late Replies offers, each stage of the signal flow has its own dry/wet mix knobs and power buttons. With effects processing at each stage, Late Replies is capable of creating everything from pitched melodic patterns to distorted rhythms, rich evolving modulations; and everything in between. The included 25 built-in effects include the potential for all of this and more. There have been a lot of new delay plug-ins released in the past half year or so; each with their own unique features and qualities. But Late Replies brings everything, and way more, all under one virtual plug-in roof. Blue Cat Audio is redefining the traditional ways we think of a plug-in. Instead of a single function effect, Late Replies is a “host” that incorporates the outside world into its internal functions. Think of it as a kind of plug-in workstation, and you’ll be on your way to discovering the huge universe of sonic possibilities it can bring to your music and sound design. Late Replies costs 129 EUR or USD (tax included). The introduction price is 96 USD or EUR (25% off), until September 17th. Existing customers will be granted a larger discount, offer sent by email. McDSP has come out with a new multi-band dynamics plug-in. The 6034 Ultimate Multi-Band Dynamics Processor takes all of the great sounding modules we love from the 6050 Ultimate Compressor and puts them into a new container with a four band crossover network. Multi-Band compression has never been easier, or more fun! The cross-over section at the top of the interface is very intuitive to use. There is a low and high shelf, with two bands in between. The choice of slopes (24 dB, 12 dB, or 6 dB per octave) offers great flexibility in how surgical versus smooth sounding you want the transition between the ranges. I like going for a gentler slope on a master bus, for less dramatic differences between the different ranges. The module section has the familiar modules we know from the 6050 Ultimate Compressor, some of which have been enhanced with internal makeup gain; making them even easier to use effectively in a multi-band context. There are three gating/expansion modules available to round out the choices. I used the EZ G gate to tighten up the bottom end of a drum bus while compressing the areas above with different degrees of intensity. The module Bay houses the four modules. Each is conveniently fitted with a bypass and solo button.The inclusion of the ability to link them is a nice touch. Often we don't necessarily need dramatic differences in the four different ranges. This allows the user to conveniently set the common values between the modules, while still being able to unlink them when necessary to make specific tweaks where necessary. And of course, the highlight of the McDSP "ultimate" line of plug-ins, is the easy ability to swap out models on the fly. So, once you have your general settings in place, it is easy and fun to experiment with different types of compression in the different slots. The 6030 Ultimate MB ships with a ton of useful preset to get you started. This plug-in is possibly the least intimidating multi-band dynamics plug-in I have ever come across. It is not only an excellent way for beginners to get started with multi-band compression, but also a fantastic tool for experienced users to quickly audition different styles of compression in different areas of the frequency range. 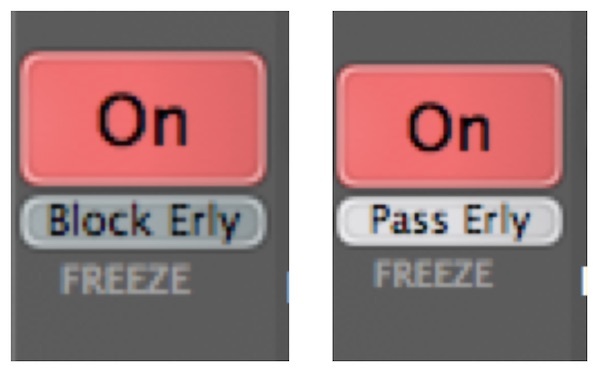 Logic Pro's MultiPressor is great but has nowhere near the palette of sound options found here. Head over to McDSP and check it out. It’s currently available at an introductory sale price of $129. Eli Krantzberg reviews Eventide Ultratap, a brand new soundscape tool capable of producing huge spaces, glitchy gated delays, crescendoing volume swells, comb filtering, modulation, and more. Eventide are masters at chipping away at conventional boundaries. They've successfully bridged the gap between live and studio effects with their vocal processing algorithms. 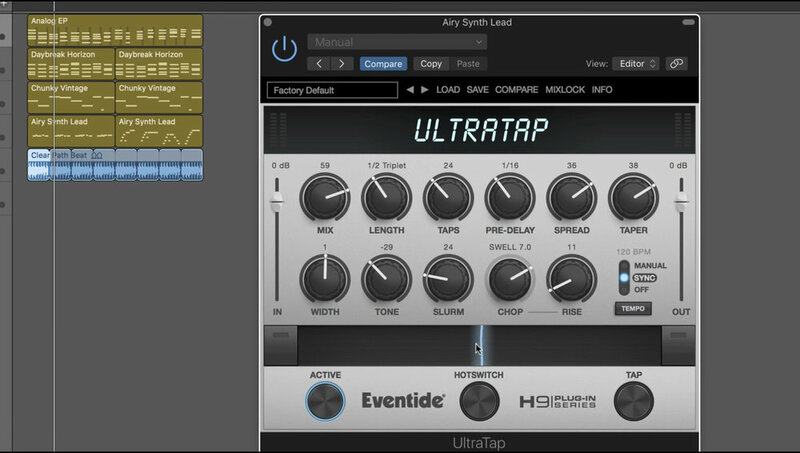 And now they're changing the game again with their new Ultratap plug-in. Is it a delay plug-in? Reverb? Modulation? Gate? Dynamics? With so many fantastic delay plug-ins, not only from other companies but from Eventide themselves as well, having a fresh creatively stimulating tool like this is very welcome. Ultratap is much more than a multi-tap delay-line effect. It's a soundscape tool, capable of producing huge spaces, glitchy gated delays, crescendoing volume swells, comb filtering, modulation, and more. Aside from the usual delay controls, there are a few extras in here that make this plug-in unique. The Spread and Taper controls are used to adjust the spacing and volume of the delays. So you can create ahead of the beat or behind the beat waves of repeats that swell up or down. But the Slurm and Chop controls are where this plug-in really shines. Slurm adds a juicy tap slurring/smearing modulation. It combines slow random multi-voice detuning with modulation and a small reverb like diffusion. The more you dial it up, the more the taps get increasingly smeared, loosing their attack and definition. The result is a unique fluid chorused sounding "tail" to the input signal. The Chop control is described in the manual as a "pre-tap chopping tremolo or auto volume processor". The function changes throughout the knob's range. First, there are several LFO waveform shapes for a tremolo like effect. A second knob controls the speed of the LFO. This is followed by two auto-volume processors that create either volume swells or a gating effect; again with their values controlled from a second knob. The horizontal Ribbon control is an easily programmable macro for controlling several parameters at once, like grabbing several knobs simultaneously on a hardware unit. There is no stepped movement between the values of any of the controls, so they can be moved and modulated freely without any zipper type noises. And finally, the Hotswitch button allows you to smoothly switch between two sets of parameter snapshots. For those looking for creative delay/modulation based effects, Ultratap from Eventide is absolutely worth taking a look at. It's very user-friendly. There is a huge variety of presets to work with. And a slim thirteen-page manual to go through if you want to roll your own. You can get Ultratap for $49 through September 5th 2017. Apple Logic Pro’s plugins are, for the most part, fantastic. But one conspicuous omission is the lack of a tape saturation plugin. Before digital audio workstations, signals would be summed through a mixing desk and printed to tape. Driving a strong signal to the tape deck would saturate the signal and give it a thick and warm quality. In modern parlance, we often hear buzzwords like “glue” and “harmonic distortion” to describe the cohesive effect recording to tape had on the audio. In recent years many third party developers have tried their hand at emulating the type of warm saturation and subtle distortion that audio recorded and mixed on analog tape have. McDSP was one of the first with their AC101 and AC202 plugins. UA, Waves, Slate, to name a few, have all followed with variations on a similar theme. They all impart certain qualities that enhance digital audio and impart tape-like qualities to the audio run through them. Enter Softube. Their newest offering, Tape, is the latest addition to the smorgasbord of tape emulation plugins out there. Now, no plugin will be a panacea for bad recording, arranging, production, or mixing. But Tape may just finally be the holy grail tape plugin we’ve all been waiting for. It does all the classic tape emulation style processing we’ve come to expect from its predecessors; and more. To start with, Softube Tape contains three separate tape machine emulations. The differences between the three models are generally subtle, until you start pushing some of the other parameters beyond their normal tolerances. A simple Amount knob allows the user to dial in the amount of saturation desired. Softube got their gain staging right with this one. The Amount knob is programmed with a constant gain algorithm. So, as you dial it up, you won’t be distracted by differences in volume. You focus only on what the tape emulation is doing. Metering is simple and efficient. A clever toggle button allows visual monitoring not only of the input signal but of the amount of total harmonic distortion (THD) the plugin is adding to the audio being run through it. The front panel is rounded off with a choice of tape speed settings. In addition to the familiar values, ultra slow tape speeds of 3 3/4 and 1 7/8ths are available in case you want to push the tape effect into a grittier type of distortion. If the functions on Tape stopped here, it would be enough to be a great sounding traditional tape emulation style plugin effect. But a click on the side panel reveals some extended parameters that really make this plugin special. A dry/wet knob and separate Input/Output faders allow for a completely different level of gain staging that opens the plugin up to much more colorful processing. Push the input to the tape emulation for more saturation, and balance the output level either with the dedicated fader, or the dry/wet knob, for a richer range of tape-based saturation. The speed/stability knob introduces a pitch modulation, that when combined with the dry/wet knob, creates a rich tape-based style chorusing effect. I for one can’t wait to try this on some vocals! The High-Frequency Trim and Crosstalk knobs, however, push the traditional aspects of tape saturation to new levels. One of the aspects of traditional tape is that the more you drive it and saturate it, the warmer the sound gets. But at the expense of some of the high end. Use the High-Frequency Trim to regulate the amount of high-frequency compensation. When pushed past twelve o’clock, a rich upper sheen is introduced to compensate. I tried it on a drum bus and the high hats came to life. They had a crystal-clear sparkle, without compromising the “tape-iness” introduced with the amount knob. Move the knob to the lower half of its range for more of the vintage tape style warmth and fatness. The Crosstalk knob controls the amount of "leakage" between channels on multichannel audio. So, dialing this up on a stereo bus adds the “glue” to the stereo image that we have come to love from tape emulation plugins. The stereo imaging is maintained of course, but the crosstalk adds a cohesiveness to the stereo image that tightens up the whole stereo image. It beefed up the drum bus and master bus I tried it on nicely. Logic Pro users are generally pretty happy with the effects bundled with the DAW. But, as I mentioned at the top of this review, tape saturation is absent. Tape fills a much-needed void in Logic Pro’s rich collection of effects processors. And it may very well be the last tape emulation plugin you’ll ever need to buy. In this video, Eli Krantzberg reviews the all new Objeq Delay plugin developed by Applied Acoustics that was released today. Objeq Delay is a creative effect processor based on Applied Acoustics Systems (AAS) physical modeling technology and uses no sampling nor convolution algorithms. It is an effect processor built around the combination of a filter, acoustic resonators and a delay module. The input signal is first processed through filters, then acoustic resonators such as drumheads, strings, plates, and bars, allowing to add acoustic resonances to the sound and change its timbre. Objeq Delay can both transform the timbre of the incoming signal and create rhythmic effects and/or add echoes to the signal. The transformed signal is then sent to a pre-delay followed by a second delay with feedback loop that either preserves the stereo imaging, or sums the signal and bounces it from side to side in Ping Pong mode. Objeq Delay also includes an LFO module for the modulation of the different filter, resonator, and delay parameters. Finally, a Mixer modules allows one to control the amount of dry and wet signal in the output signal as well as to control its general output level. Objeq Delay is available now at a suggested retail price of US$139 but until May 15th, 2017, you can get it at the introductory price of US$99. The delay plugin runs on both Mac OS X and Windows in 32- and 64-bit hosts supporting the VST, Audio Units, and AAX Native plug-in formats. Visit Applied Acoustics Objeq Delay for more information, video tutorials and to try out the plugin for free. Exponential Audio offer three fantastic sounding reverb plug-ins. Phoenixverb, R2, and Nimbus. R4 ups the ante with unprecedented features to shape the early reflections and tail portions of the reverb signal independently. It is the culmination of “clean” and “character” reverbs rolled into one easy to use reverb plug-in that does everything you need and didn’t know you needed from reverb. Let’s take a look at what makes R4 unique. To start with, you can filter the incoming audio before it hits the reverb engine. This feature alone is valuable, in that it eliminates the need for a pre-EQ plug-in on your reverb return channel strip. There are two more filtering sections in R4. One for the early reflections and one for the reverb tail. One of the new flagship features is the ability to modulate the early reflections and reverb tail filter frequencies with two separate LFOs, so they are constantly moving. This feature works particularly nicely with the band-pass and notch filter modes, as it creates a sweeping filter effect on the reverb that adds interesting and colorful movement to your reverbs frequency range. One of R4’s main strengths is the ability to shape and control the early reflections and reverb tail sections independently. The onset of the entire reverb signal, beginning with the early reflections can be delayed via pre-delay that is optionally synced to the host tempo. This allows for an impressive rhythmic pulsing reverb that is tied to musical subdivisions of your song’s tempo. Additionally, the onset of the reverb tail can be offset separately from the early reflections. Using separate offsets, tied to musical subdivisions or otherwise, adds interesting complexity to the relationship between the source audio and the listener’s perspective. Another nice addition is the ability to control the width in the stereo spectrum separately for the early reflections and the reverb tail; again adding complexity to the perceived size of the space being simulated. This feature is particularly useful, combined with the other early reflections features when mocking up orchestral instruments and establishing a position within the room for various instruments before they reach a common reverb tail. For example, set up separate instances of the R4 as inserts on each instrument’s channel strip. Turn off the reverb tail in all of them, so that only the early reflections are audible. Adjust the early reflections attack, pattern, time, width, and slope parameters uniquely for each, to establish their positions within in the room. Exponential Audio R4 has some new interesting and complex early reflections patterns to choose from that makes this very effective. Then set up a send on each channel strip going to a shared instance of R4 with it’s early reflections level turned off completely. Use this reverb for a shared common space, while the individual early reflections situate them each differently within that space. I don’t know of any other reverb plug-in that does this so effectively. R4 inherits the R2’s interesting chorusing and pitch modulation of the reverb tail. New in R4 is the addition of the Hall 2 reverb algorithm. With this comes the ability to also modulate the density of the reverb. This feature can be used either separately or in conjunction with the chorus modulation. Combined with the chorus functions, a creamy and thick reverb tail can be established either with or without pitch modulation, depending on which chorus algorithm is used. So, in other words, the density and chorus modulation can be blended either for a subtle thickening effect, or to stand out with pitched modulation as wild or tame as desired. Or the two can be used independently. 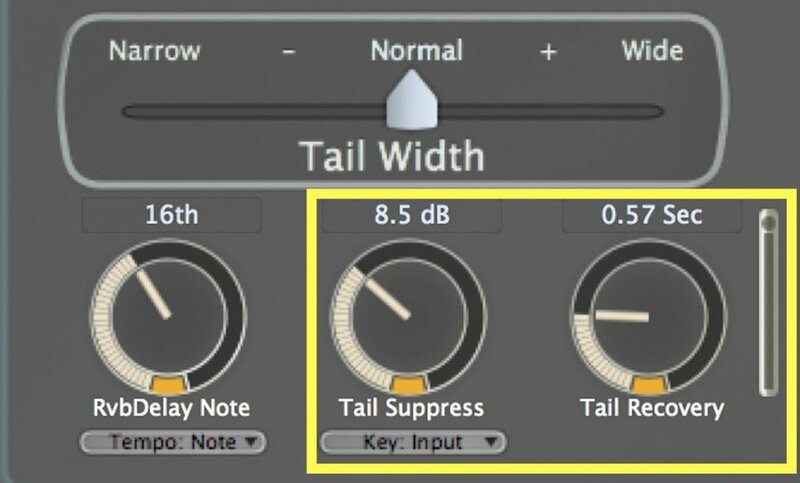 One of my favorite features in Exponential Audio R4 is the tail suppression and recovery function. It acts as a kind of reverb “ducker”. The suppression knob causes the reverb level to be lowered when the input signal is strong. The recovery knob controls the “bloom” of the reverb once the suppression ends. It’s kind of like sidechain compressing the source and the reverb together so that the reverb is heard less when there is source signal, and more when there is empty space. It’s a beautiful way to control your reverb and works not only on vocals but instruments as well. At extreme settings, it’s a great “pumping” style effect. The reverb tail itself can optionally be used, either alone or in conjunction with the input signal, to trigger the suppression. R4 also inherits the warp features introduced last year with Nimbus. This can dramatically color the reverb tail in a combination of three ways. First, it can be compressed. With full control over attack, release, and knee, the compression stage can vary from subtle to making your reverb very thick and present. The second is via the overdrive/saturation stage. This is one of my favorite Exponential Audio reverb functions. I have not seen anything like this in any other reverb plug-in. Subtle “good” distortion can be added for great effect. The crossover is used to apply this distortion to a limited part of the frequency range. By restricting it and letting the highs pass through unaffected, there is a rich, thick density added to the meat of the reverb, while still retaining the bright top end. By limiting or eliminating the highs from passing through, an impressive dark quality is imbued to the entire signal that sounds fantastic. And lastly, the Warp engine can be used to reduce the word size of the reverb. This option is useful in emulating vintage or retro style hardware based reverb sounds. The Gate functions are slightly enhanced from those found in R2. It allows the reverb levels to be controlled by the characteristics of the input signal. The reverb tail is truncated, either sharply or gradually, based on the absence of the source audio. Unlike the suppression function which reduces the level of the reverb this gates it completely (or in part). It’s perfect for getting big gated Phil Collins-style reverb effects on snare drums. The freeze section, completely new to Exponential Audio reverbs, does the exact opposite. It allows the reverb to sustain indefinitely, regardless of whether there is a source signal present or not. This is an incredible effect and works best with larger spaces. Early reflections can optionally be blocked or allowed to pass through. When the early reflections are allowed to pass through, it creates a sustained frozen reverb sound that contains subtle movement within. Depending on the context it is used in, the freeze function may benefit from being coupled with some automation. This allows you to selectively enable/disable it at specific places in your arrangement. The only thing even remotely related to this within Logic Pro X is PlatinumVerb; which is like an ancient ancestor compared to the functions and control available in R4. I remember when convolution reverb was all the rage, when Space Designer first came out in Logic, circa 2003. Algorithmic reverbs took a temporary back seat, but they are back and have been back for quite a while. A lot of users find Space Designer, and similar convolution reverbs, difficult to control. They can easily overpower a sound. And draw more attention to the space than to the actual source audio. I think that was the initial appeal of convolution reverbs when they were introduced. But many engineers have come back to preferring the subtlety and less obtrusive nature of algorithmic reverbs. We have seen offerings from UVI, Fab Filter, Waves, Zynaptiq, Eventide, and others. And they are all great. Algorithmic reverbs have a different way of blending with the source audio in a mix than convolution reverbs. Many engineers find them to be more transparent, subtle, and flattering to the source audio they are used on. Exponential Audio though seems to be in a class of their own. Their rich, fully featured reverb plug-ins offer the user the control to get everything from clean and subtle reverbs that wrap around your audio like a fur coat, to more pronounced effects that draw attention to highlighting the source audio they are fed with. Exponential Audio R4 is, in my opinion, the culmination of all the Exponential Audio smarts that are spread through their other three plug-ins. It does just about everything they do combined, plus more. For those weary of learning to control all the the nuanced parameters available, no worries, R4 ships with over 1200 presets that will get you 95% of the way towards your final sound. Adjust the simple basic controls in the center of the interface, and you’re done. Great world-class reverb, with minimal fussing. If you own other Exponential Audio reverbs, R4 is a worthy addition. In my opinion, the freeze function, tail suppression, separate width controls for early reflections and tail sections, and advanced modulation functions, are worth the price. If you are new to the brand, R4 would be my first choice of the four. It does everything the others do, and more. Exponential Audio reverbs feel like driving a fully decked out Cadillac. If you are into reverbs, you owe it to yourself to check them out. R4 is available for $299/€289, with special upgrade pricing for existing Exponential Audio customers. The introductory period runs through March 24, the discount is $150. You can also download a free fully-functional 21-day demo of R4. You'll need an iLok2 or iLok3. For more information, visit R4 at the Exponential Audio website. Before you ask, this is a “character” plug-in. Yes, you can generate interesting and complex delays with Logic Pro X’s Delay Designer, Tape Delay, and Stereo Delay. But the new EC 300 Echo Collection plug-in from McDSP has so much character, colour, and vibe; that to me, it’s in a class of its own. The EC 300 is branded as an Echo Collection. Although it is a single plug-in, the EC-300 Echo Collection brings the sound of dozens of echo and chorus effects into a single plug-in. The three delay types - Magnetic, Digital, and Analog - come with a generous collection of user controls, plenty of character modes, highly stylized visual feedback, and McDSP’s nearly two decades of gear modeling experience. I had a ball playing with it and found it to be not only versatile, but full of personality that gave an interesting vibe to the tracks I used it on. Setting the dual delays to tight delay times, combined with pitch modulation and saturation yields really interesting chorus effects. The character modes all sound unique and slightly different. More traditional tempo synced effects sound great and really special when combined with the built in saturation and pitch modulation. The Delay model is really interesting. You can integrate the SIMs (Synthetic Impulse Models) from McDSP’s Futzbox to generate some really interesting EQ that can be placed either in or after the feedback loop. Check out this video to see and hear the McDSP EC 300 Echo Collection in action in Logic Pro X 10.3. Every once in a while a new plug-in comes out that really does something, well, new! And Eventide Fission is one of them. I have had the great pleasure of being able to give it a spin, and it is fantastic. The only thing that comes even a little bit close to doing what it does within Logic Pro X’s suite of built-in plug-ins is the Enveloper. So, what is Fission? Fission appears to be what (I hope) is the first of a series of new plug-ins from Eventide using it’s new Structural Effects technology. Fission separates the incoming audio signal into two parts based on the signal’s structure, in this case Transient content and Tonal content. These two different streams are processed individually with custom Eventide effects, and then combined back together in (close to) real time. Because the Transient and Tonal structures of the signal are processed separately, Fission lends itself to some very useful and interesting mixing and sound design purposes that haven’t before been possible. The interface is very intuitive. The centre row is the Structural Split section, which performs the separation magic. Choose one of the source type presets, and use the focus slider to control how much of the signal’s energy is directed towards the Transient Effects section, and how much to the Tonal Effects section. Use the Smoothing and Transient Decay knobs to tweak the detection algorithm. Once the split is established, the gain can be offset separately for the Transient and Tonal sections. This alone makes it a fabulous transient shaper plug-in. Even using just this gain offsetting functionality, Fission is miles above Enveloper. Enveloper is to Fission what Garageband is to Logic Pro X! But this is just Fission’s starting point. Post Structural Split, the Transient signal is independently processed through a selectable Effect Block, while the Tonal signal is independently processed through it’s own selectable Effect Block. The controls update, depending on which effect is chosen. Transient effects include Delay, Tap Delay, Dynamics, Phaser, Reverb, and Gate + EQ. Tonal effects include Delay, Compressor, Pitch, Chorus, Reverb, Tremolo, EQ. All kinds of great sounding combinations, either corrective or creative, are possible. How about a nice warm Rhodes sound with a washy chorus effect only on the sustained portion of the sound, while the attack portion is enhanced with some compression? Or maybe Delay on the attack portion and reverb only on the sustained, or tonal, portion. Or maybe vice versa! Drums are seriously fattened by detuning the tonal part of the drum with the Pitch effects, while retaining the crack of the transients at their original pitch. Each of the three main sections (Structural Split, Transient Effects, & Tonal Effects) can be switched on or off independently. So, it’s not absolutely necessary to process both parts of the signal. Turn off the Structural Split section, and the Focus fader becomes a send fader to balance the two effects that will operate on the entire signal. Each effect block can be soloed as well. This is not only great for dialing in the balance of the structural split, and fine tuning the effects; but they can be left in their soloed state when closed. This way either just the attack portion or the just tonal portion of the signal is played through the channel strip it is hosted on. This is great for layering drum sounds together. Duplicate your drum part onto multiple tracks triggering different samples. Then blend the attack of one drum on one track, with the sustain of another drum placed on another track. Works wonderfully layering pads and other keyboard sounds together too. Eventide Fission is a seriously great sounding plug-in that stimulates experimentation otherwise not possible. I highly recommend giving it a spin. And kudos to Eventide for really imaginative and creative plug-in development. And for inventing new tools that we didn’t know we needed, and now can’t live without! 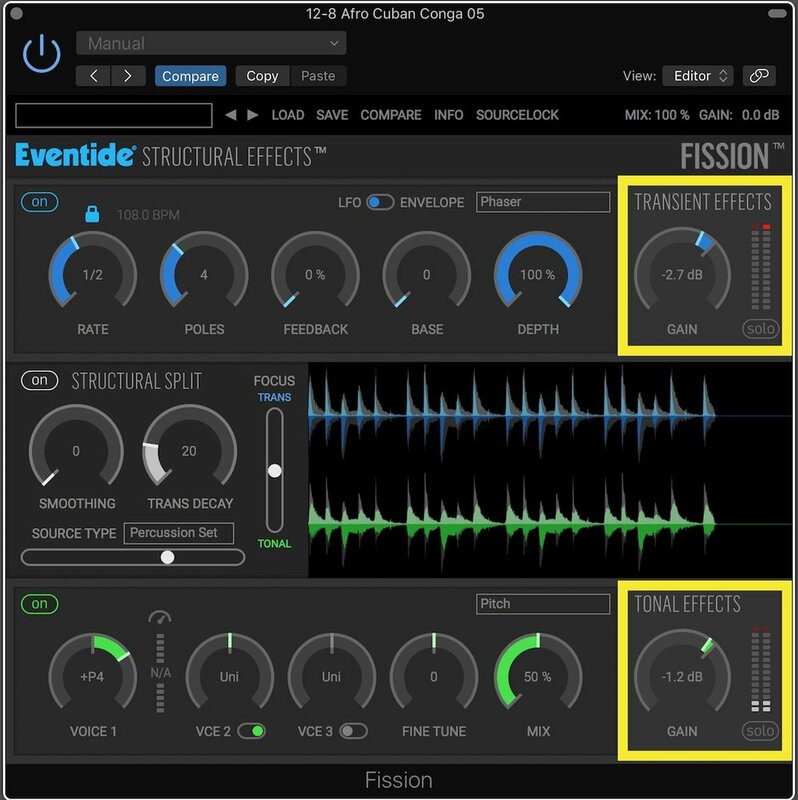 Eventide Fission is currently priced at $97 instead of $179. To buy, or to try a free, fully-functioning, 30-day demo, visit the Fission product page on the Eventide website. Note that Groove3 already has a series of video tutorials about how to use Eventide Fission, produced by yours truly. You'll get to learn the new plugin inside and out, as well as how to use it on different sounds and instruments! They are free for any registered Groove3 user, so anyone can view them for free simply by registering at Groove3. Just head over to Eventide Fission Explained at the Groove3 website!